Whether it’s a Birthday, Communion, Confirmation or any other reason to celebrate, treat your guests to a beautifully decorated candy cart. We are happy to deliver our candy cart to your door anywhere in Cork City or County. You can choose from one of our packages or we can put together something extra special for your occasion. If you have a theme in mind let us know and we will happy to create your vision. 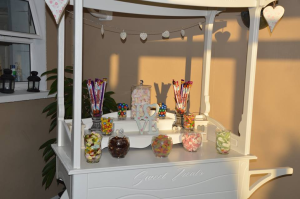 On the day of your event we will set up the candy cart at your venue, we will also provide you with scoops and bags. When your party is over, we will collect the candy cart and pack up any leftover candy for you to enjoy later.